A while back, I took a Cider Donut tour with Daniel B. of FUSSYlittleBLOG fame. The last stop on the tour was Love Apple Farm in Ghent, NY. I was completely unfamiliar with this place, but there are a number of reasons everybody in upstate NY should have heard about it. I actually made it this far on the tour because Daniel touted Mexican food being available for lunch there. And there was. They have a small kitchen on the side of their country store where there is a young Mexican lady making authentic street food. But I have to say this whole place was a very overwhelming experience! And I’ll start at the beginning for this. When I pulled in, my attention diverted immediately to the Mexican food stand. I was absolutely flabbergasted! As I observed more and more, it made perfect sense to me. A large percentage of the clientele, actually everybody I even saw who wasn’t on Daniel’s tour, was of Latin American descent. I’d say that’s a smart way to work the demographics. I made my way into the country store; I found everything you’d find in a farm stand country store in the fall. Apples. Honey. Cider. Cider donuts. Gigantic posters of the female from Terminator 3. Well, Love Apple Farm is owned by the Loken family. Kristianna Loken was the young lady who played the most technologically advanced terminator in the third Terminator movie. She has also made a name for herself in the science fiction genre. I particularly enjoyed her appearances in Showtime show, The L Word. Great show. The Loken family is very proud of Kristianna, and by walking around their farm, it shows. Hell, her wikipedia page even says that she grew up on the farm! So after we sampled cider donuts, I ordered some Mexican food from the small menu. Isn't it cute that the tray is an apple? I had a taco and a tamale with rice and black beans. This was a great treat. I’m pretty down about Mexican food in the Albany area. This isn’t exactly the Albany area, and the selection isn’t that extensive, but it does the trick. The rice was flavored nicely. I was one of the first customers when they opened so it’s possible that it hadn’t had a chance to rest and resulted in a slightly wet rice, but the flavor was all there. 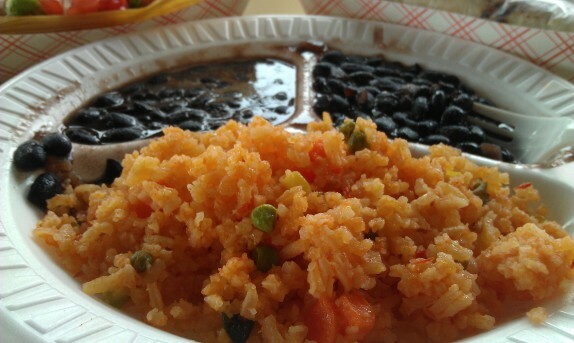 The rice tasted even better with with the beans. The taco was pretty awesome. The beef was carne asada, meaning there was a deep flavor from the marinade and cooking process. The tomatoes on top were another treat. I am normally not a fan of tomatoes, but these were fresh, sweet, and flavored from jalapenos. The tortilla was flour, so I guess corn would have put it over the top, but I enjoyed it anyway. Besides, I had plenty of corn with my tamale. 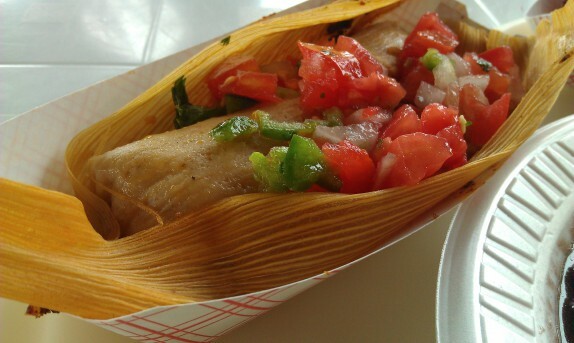 The tamale was made with a very flavorful masa, was seasoned nicely and was filled with a nicely stewed pork. This was also topped with the jalapeno spiked salsa, as you can see from the above image. Absolutely delicious. Love Apple Farms has a few things to be proud of that I experienced. Decent cider donuts. A nicely organized farm stand. Terminator 3. And the Mexican food stand. Love Apple is great – it’s on my daily commute. Unfortunately the lunch counter is closed by the end of the work day. The cool hippie chick who works there told me that I could call in an order and they’d set it aside until I got there. Of course, now it’s November and the hours are limited…I’m not sure if the lunch counter is even running at this time. 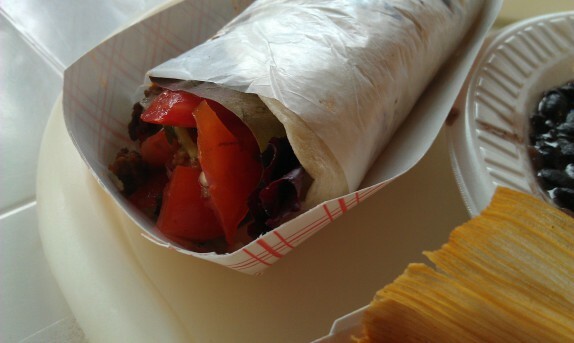 You make a good point about Mexican food in this area – it’s sorely lacking. The few Mexican places around are to be ridiculously overpriced and not very authentic. Where I grew up in Illinois we had a respectably large Hispanic population so we had a plethora of mom and pop cheap Mexican eats (where you can get stuff like a giant carne asada burrito for $4 at dinner). 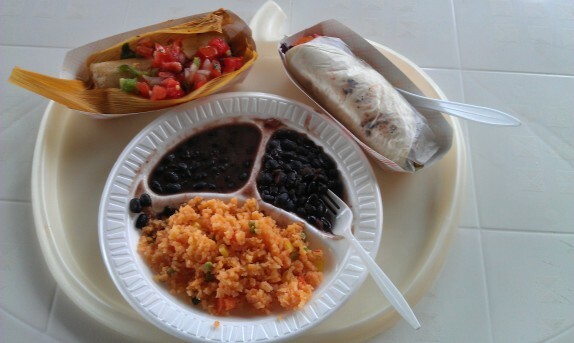 I think I’ve seen a tamale stand at the Troy Market, but I’m usually there at 9AM so not exactly craving lunch food. I should go later and try that stand and Nighthawk. I’ve tried those tamales. They are very good as well. The overcast sky and pavilion top worked in my favor that day. I do appreciate the feedback.